Looking for the plastic plug for the lens that covers the clock. My car has no clock and the plug fills the hole where the clock adjusting stem would be. I've had the thing for 43 years and have lost it. Does anyone have one? I'll get a photo posted...that will help explain what I'm looking for. Do you have a pic of what the plug looks like?? I have never seen a malibu without a watch in it. This is a first. If you take of the front panel, you can replace the plastic glass with a new piece of clear plastic without a hole in it. Im sure it is easier than finding a plug. Plus the hole will be gone alltogether. Joe73 wrote: Do you have a pic of what the plug looks like?? Unfortunately, no. It's clear, somewhat mushroom-shaped and fits loosely into the hole...that's how it became lost. I should have put a bit of glue on it. 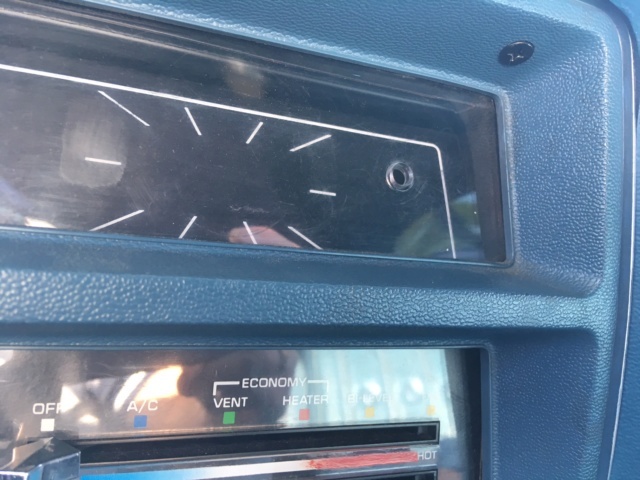 When my parents bought the car in 1975 they opted for Air Conditioning but no clock! I can't imagine a car today where the option of not ordering a gauge/feature is just an empty spot.